2005. At last, the Hypnos label debut of one of the great names in ambient/electronic music, Robert Scott Thompson. At the Still Point of the Turning World is spacious and meditative, yet with a delicate musicality. Robert is Director of the Center for Audio Recording Arts (CARA) in the School of Music at Georgia State University in Atlanta. He also runs the Aucourant Records label, which has released selections of his work in a wide range of styles. "Robert's latest disc features lots of shorter quiet tracks, often with intricate layers to explore. Starting in a most understated fashion, "Of Mirrored Air" is barely audible for the first minute. It is like listening to small ripples on an otherwise still pond. "Causal Connecting Principle" is both brooding and sad, and will send unsettling shivers down your spine. "Airport for Shadows and Dust" (great name) is smooth as glass, but dark as obsidian at times. "Presences" is a dissonant, richly complex work, even though it lasts less than two minutes. "Water out of Sunlight" is somewhat brighter as the name implies, but tinges of shadow remain. Distant flutes begin "When Dreams Collide," the disc's most delicate floater. Traces of classical influences creep in on a few numbers including this one. The title track plinks out sparse notes as rumbling drones and odd strings ring out, like plucking the inside of a piano. All twelve tracks are compelling in their own way, but my favorite may be "Tinted In Temporal Hue," particularly the midsection with its rich layers of dark synth textures. After so much darkness, Thompson brings us into the light on the closing track, "Figured in the Drift of Stars," a beautiful piece with piano and slow washes of synths. It reminds me of Brian Eno's classic Apollo, and makes a serene finish to another great piece of Thompson's artistry." "Count me in as a fan. The CD arrived yesterday, and I've given it a few spins so far and plan many more. I've never heard any of Thompson's work before, but I am impressed and want to seek more." 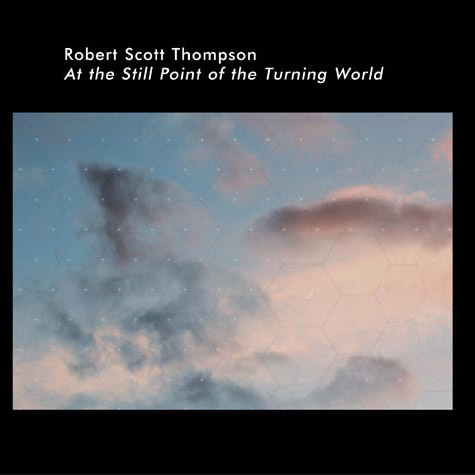 " Robert Scott Thompson is one of the mainstays and legends of ambient music. He has created music in a variety of styles but his atmospheric ambient efforts are his best. At The Stillpoint of a Turning World is his first release on the Hypnos label... This is an awesome CD! While it might be Robert’s best music ever, it is certainly among his top five or six. It is also one of the top Hypnos releases ever. Robert combines organic textures and metallic timbres with gentle drones and deep atmospheres. There are just enough gray washes to keep the disc somber but not dark. It plays as a long-form soundscape with 12 movements. The gentle drones provide the continuity. There is a certain progression here as well. Robert has always been on the cutting edge and he combines spiritual approaches to his craft. That approach gives his compositions and this set special appeal. This is a great CD and a wonderful start to a new year of more great sounds!" Will this finally be the CD to get Robert Scott Thompson his well-deserved recognition and sales? If ambient music fans continue to turn their back on this artist's work, and especially if they don't check out At The Still Point Of The Turning World, they are missing out on truly breathtaking music. Unlike a lot of minimalism, I fell in love with this album immediately. The depth of emotion in the compositions, the complexity inherent in the blending of classical influences with ambient minimalism and subtle electronic experimentalism, the juxtaposition of beauty with sadness, all combine to form a stunning cohesive whole that surely should land on many a "Best of" list at year's end. I'm confident it will do so with me."